Walt Michaels (born October 16, 1929) is a former professional football player and coach who is best remembered for his six-year tenure as head coach of the NFL's New York Jets from 1977 to 1982. In 1977, Michaels was inducted into the Virginia Sports Hall of Fame and, in 1997 he was inducted into the National Polish American Sports Hall of Fame. A son of a coal miner from Swoyersville, Pennsylvania, Michaels was a two-sport athlete at the local high school, then went on to play collegiately as a fullback at Washington & Lee University. During the 1950 season, he helped the Generals reach the Gator Bowl, but was unable to play in the contest due to an appendicitis attack he suffered one week before the New Year's Day game. In the 1951 NFL draft, he was selected in the seventh round by the Cleveland Browns, but was traded to the Green Bay Packers during the summer training camp. Michaels was used primarily on special teams during his rookie season in Green Bay. 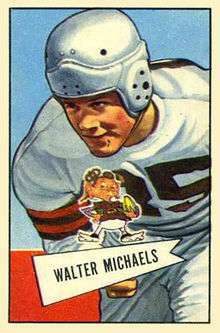 On April 29, 1952, Michaels was traded back to the Browns for three offensive linemen, and played a key role in the team's defense over the next decade at linebacker. Often used to call the defensive signals, Michaels intercepted 11 passes, including four in 1952, and also returned two of them for touchdowns. In those 10 years, Michaels helped the Browns play in five NFL Championship games, winning consecutive contests in 1954 and 1955. On April 3, 1962, Michaels entered the coaching ranks when he was hired by the American Football League's Oakland Raiders as the team's defensive backs coach. He would spend only one season there, with the success he enjoyed with the Browns nowhere to be found. The Raiders lost their first 13 games before winning the season finale, playing in Frank Youell Field, a temporary stadium. At the start of the 1963 season, Michaels signed with the American Football League's New York Jets. After playing in just one game, Michaels accepted the defensive coordinator's position with the revamped Jets under Weeb Ewbank, who had coached him at Cleveland. Within six years, the team defeated the Baltimore Colts in Super Bowl III, with Michaels seemingly the heir apparent to replace Ewbank, following the departure of fellow assistant Clive Rush. However, Michaels' career fortunes changed dramatically on February 1, 1973, when Ewbank hired his son-in-law, Charley Winner, and designated him his successor after the upcoming season. Michaels immediately resigned and within two weeks later had signed to become the defensive coordinator of the Philadelphia Eagles, working under former Browns' teammate Mike McCormack. Three mediocre seasons in Philadelphia followed, with McCormack and his staff dismissed at the end of the 1975 NFL season. After Winner was also dismissed as Jets head coach, Michaels returned to New York, again resuming his role as the main coach on defense under new head coach Lou Holtz. Holtz's one season at the professional level turned out to be a disaster, leading him to resign in the days prior to the last game of the season. On January 4, 1977, Michaels was officially selected as head coach of the Jets, beginning six seasons of wildly contrasting results. Michaels' first season saw the team win only three of 14 games, but over the next two years, the Jets managed to split their 16 contests in each year. The five-game improvement in 1978 was good enough to win Michaels the AFC Coach of the Year award. The 1979 season was another 8–8 campaign that was marred by a quarterback controversy. Starter Richard Todd was demoted and new starter Matt Robinson was named for the season opener against the Cleveland Browns. But days before the game, Robinson injured his throwing-hand thumb during horseplay with Joe Klecko and tried to hide the injury, but was forced to reveal it the night before the game. The thumb was treated and the Jets took a 22–19 lead in the final quarter. Robinson had the tape on his injured thumb removed thinking the game was over, but Brian Sipe led a game-tying Browns drive, and in overtime Robinson, unable to grip the ball, threw a sloppy pass for Wesley Walker that was intercepted and turned into a Browns game-winning field goal. Michaels never used Robinson again even as Richard Todd got injured. A rough 4–12 season in 1980 was followed by an 0–3 start. Following a 31-30 loss to the Bengals an ugly Monday press conference occurred. Michaels angrily confronted New York Daily News writer Bill Verigan an hour before the press conference, then in the ensuing conference Michaels' eyes were described as "glazed" and his speech "slurred." Despite this the Jets surged to win ten games, securing their first playoff berth since 1969. The year's success ended with a 31-27 defeat to the Buffalo Bills in the AFC Wild Card game. During the strike-shortened 1982 NFL season, the Jets went 6–3, then pounded the Cincinnati Bengals 44–17 in the first round of that year's expanded playoff system. Traveling to face the top-seeded Los Angeles Raiders the following week, the Jets pulled off a 17–14 upset. One game away from Super Bowl XVII, the Jets arrived at Miami's Orange Bowl on January 23, 1983 to find that the field had not been covered, despite a heavy rain storm. The subsequent AFC Championship game became known as the "Mud Bowl", where the Jets lost 14–0 to the Miami Dolphins. On February 10, 1983, just 17 days after the loss to the Dolphins, Michaels unexpectedly resigned, citing a need for a break from football. He had been under severe emotional strain during the last weeks of the 1982 regular season, taking time each week to visit his terminally ill mother in Pennsylvania. Michaels would then coach the New Jersey Generals in the USFL for two years beginning in 1984. One month after the conclusion of the 1985 season, Michaels and his staff were let go by Generals' team owner Donald Trump after the team merged with the Houston Gamblers. The Generals never played another game, however, as the 1986 season was cancelled and the league folded after winning a mere $1 verdict in its antitrust lawsuit against the NFL. On December 21, 1989, Michaels was hired as coach of the Helsinki franchise in the new International League of American Football, a developmental league and the forerunner of the now defunct World League of American Football and NFL Europe. After his tenure in the developmental league had ended, Michaels began working for a gambling-oriented television program that would make selections on NFL games, making future job opportunities in the NFL slim. Note: The 1982 season was reduced to 9 games due to an 8-week player strike. ↑ "Walt Michaels". National Polish-American Sports Hall of Fame. June 12, 1997. ↑ Eskenazi, GANG GREEN, pp. 155–6. ↑ Eskenazi, GANG GREEN, pp. 173-76.